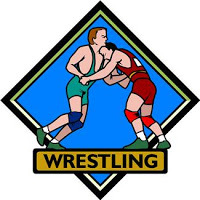 Kellogg Middle School wrestling continued their strong season on Monday with a commanding 86-24 victory over the Olympic View Pirates to improve to 5-1. The match was close early as the two teams found themselves tied 12-12 after four weights. At 103 pounds Kellogg's Shokan Conway-Yuasa scored two points on a locking hands penalty with just 14 seconds remaining for a come from behind 8-6 victory and a Kellogg lead in the team score. He was followed by Porter Lewis at 108 pounds who completely dominated his opponent for a 19-2 win. After Lewis, Kellogg got three straight first round pins to open a 38-12 lead. The two teams traded wins over the next four weights before Kellogg picked up a string of six straight forfeits from 157 to 248 pounds for the wide margin of victory. Kellogg wrestles next on Thursday, March 21st, at home against their rivals the Einstein Tigers. Wrestling begins at 3:45pm.